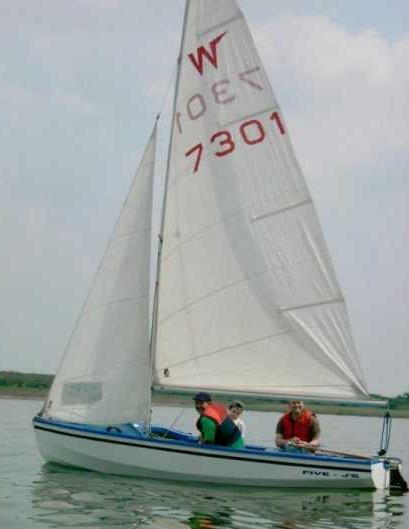 The Wayfarer Dinghy is a great boat for training as it is practically un-capsizable in my experience as it has such a wide hull (1.85m at widest point) and has enough room for 3 average sized adults to sit in it comfortably. It is also great as a day cruiser since there is so much space for 'luggage' like picnics and cameras as well as space for the kids to move about. It is quite long at 4.82m and was designed by a man called Ian Proctor in 1957. It is distinguished by a large 'W' on their sails. There have been quite alot of versions produced each using different materials such as wood and glass reinforced plastic. The wayfarer also has 3 sails: mainsail, genoa and spinnaker. I don't particularly like this boat (although I am more of a boy racer than a old chugger! ), but you may have a different opinion depending on what type of sailing you like to do (cruising or racing). As a racing boat, it is awful, heavy and quite un-manoeuvrable, but as a day cruiser or a training boat, it is perfect as it is, as I said before, near impossible to capsize (or even heel for that matter).